o yea thank you, i have discovered the answer, but that s weird because, i dont have mac system to implement the bash code. hmm, is there any other method round this? I was using another script that worked fine with 10.9/10.10/10.11 but somehow not for Sierra, even though I edited the pathnames properly. This worked perfectly and I can install the Sierra iso in VMWare. Thank you! Worked like a charm. If you run into the issue where the first line ends with Resource busy you just need to unmount the Sierra install image in diskutil. I used this to create a bootable USB. Just dd the result Sierra.iso as usual, works like a charm. I previously tried two GUI apps "Install Disk Creator" and "DiskMaker X 6" but both had issues. Note, I'm trying to run this code on OS X Lion. Huge thanks to the author.. saved me hours! Worked like a charm! Well done. Unfortunately I still get the VirtualBox message that originally brought me here: "FATAL: No bootable medium found! System halted!" PS: I'm trying to create a bootable Yosemite.iso from Yosemite.app for VirtualBox on a Mac host. This file is not a valid disc image. Please make sure you have selected the correct file. 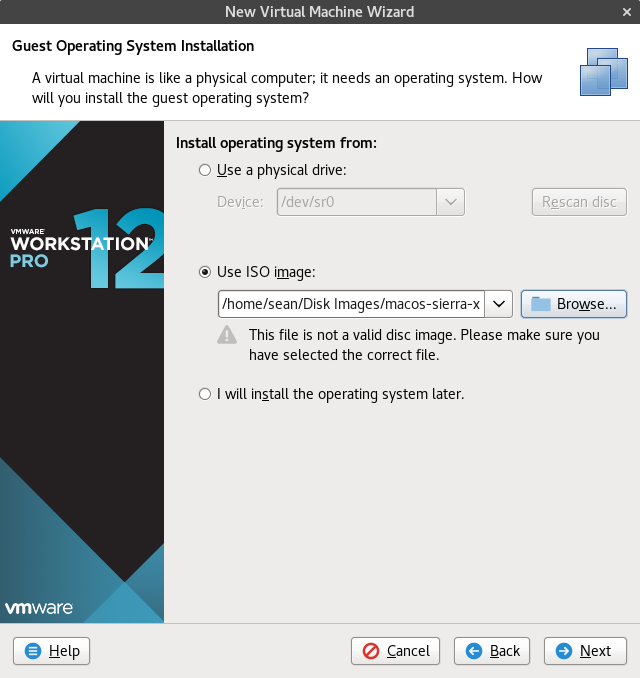 Does anyone know why VMware is rejecting the ISO file? @budwig? @seanthewebber Have you ran the unlocker for unlocking macOS on VMWare? Any idea how to create macOS 10.13 beta iso from the installation app? BaseSystem.dmg/.chunklist are outside the InstallESD.dmg. 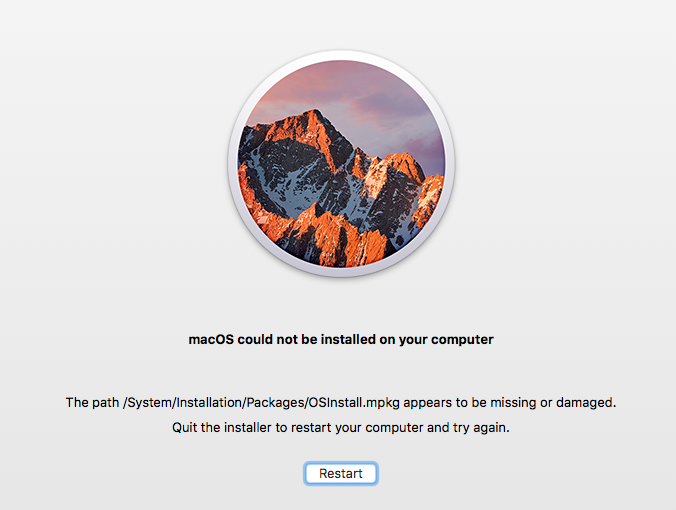 But even if I use them, an error that OSInstall.mpkg is damaged, appears at High Sierra installation. 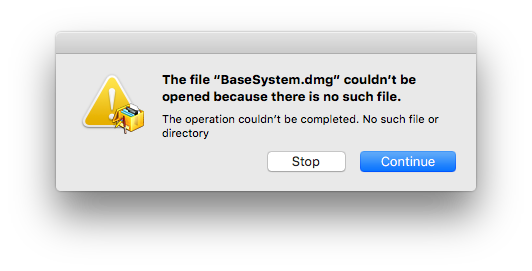 For High Sierra iso, I tried to put BaseSystem.dmg at "/System/Installation/Packages/" or at "/" as shown above, but the same error appears: OSInstall.mpkg is damaged (since it can't find BaseSystem.dmg). Pacifist gives the following error when opening InstallESD.dmg. Update: I managed to install High Sierra as an update to Sierra in VirtualBox. This blog helped me a lot. I'm still curious how to create iso for High Sierra, though. What's the difference between this process and running /Applications/Install macOS <Version>.app/Contents/Resources/createinstallmedia tool on an image file, then converting it to an ISO? Stop on "IOConsoleUsers: getIOScreenLockState" too.